Tasked with leading all-age worship? You can't turn a service into an all-age worship service just by throwing in a children's sermon and an action song. All-sorts Worship contains complete services for every Sunday of Year C, which are designed to include people of 'all sorts and conditions of life', meaning that the whole congregation worships together and nobody is tidied away. Each service offers a completely fresh set of ideas, tailored to a specific theme. This is the ideal book for real all-age worship which creates a sense of excitement and belonging in your church. 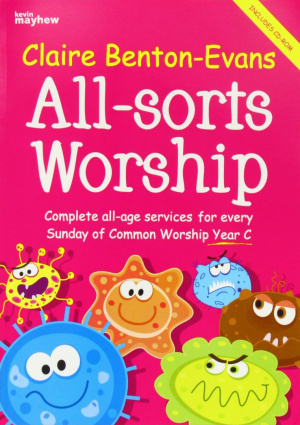 All-sorts Worship - Year C by Claire Benton-Evans was published by Kevin Mayhew in May 2011 and is our 1713th best seller. The ISBN for All-sorts Worship - Year C is 9781848675308. Be the first to review All-sorts Worship - Year C! Got a question? No problem! Just click here to ask us about All-sorts Worship - Year C.